Nasturtiums, I am told, flower best in poor soil. They attract few pests, are generally happier when completely ignored and they tend to thrive under the unwatchful eye of even the worst gardeners. Thank, God – this is a plant for me. And, even better, they’re delicious. I’ve often thrown a few nasturtium leaves in a mixed-greens salad for a bit of peppery bite and the edible flowers are great as a bright, somewhat exotic garnish. But this year’s crop is so large we could eat nothing but nasturtium salad between now and Labour Day and still have some on hand. Thank goodness for Google; one little search and presto, my problems are solved. Actually, I meant to say pesto, my problems are solved. The spicy zip of nasturtium leaves combines with the earthy meatiness of walnuts to give this pesto some real flavour heft. Freshly grated Parmigiano-Reggiano cheese gives it a slightly creamy texture and a little saltiness. 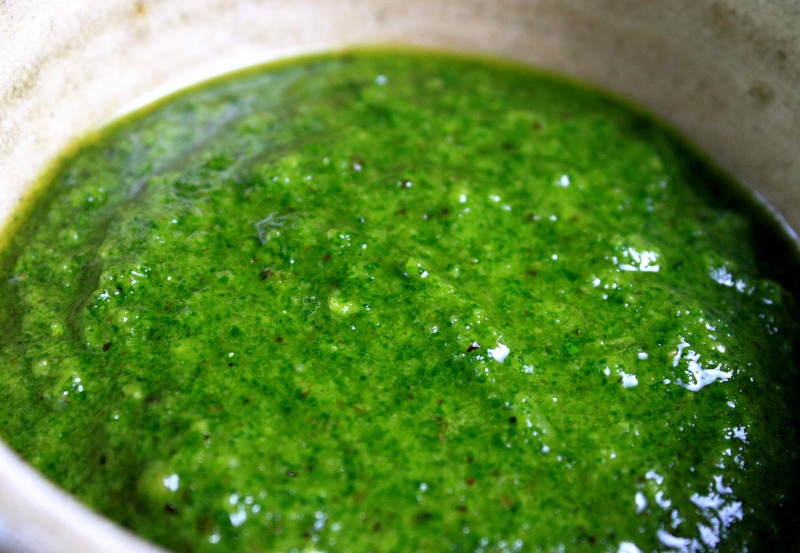 Quality olive oil and a clove or two of garlic round out this bright green pesto nicely. Use it as a quick pasta sauce, on pizza or, in any dish in which you would normally use basil pesto. Freeze it in ice-cube trays and then bag the cubes for use through the winter. The first time you serve it, don’t say what it is and watch the surprised looks when folks discover it’s not basil. Then tell them how you slaved away in the garden all summer just so they could enjoy tasting it. They’ll believe you. Put the nasturtium leaves, garlic and walnuts in a food processor and combine. Slowly drizzle in olive oil. Add cheese and pulse to combine. Taste and add salt and pepper as desired (I find the nasturtium leaves are peppery enough). Use as you would basil pesto. 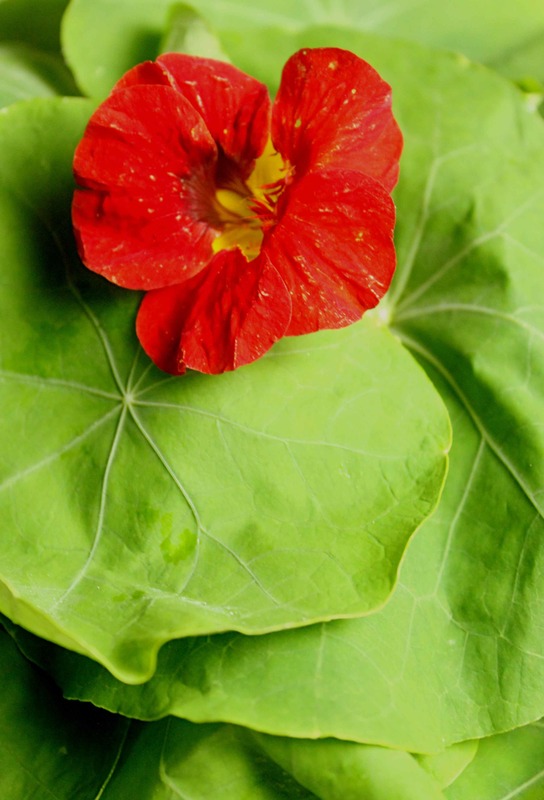 Garnish your dish with nasturtium flowers in desired. Enjoy. This entry was posted in Condiments and Sauces and tagged garlic, nasturtium, olive oil, parmigiano-reggiano, pesto, recipe, walnuts. Bookmark the permalink.